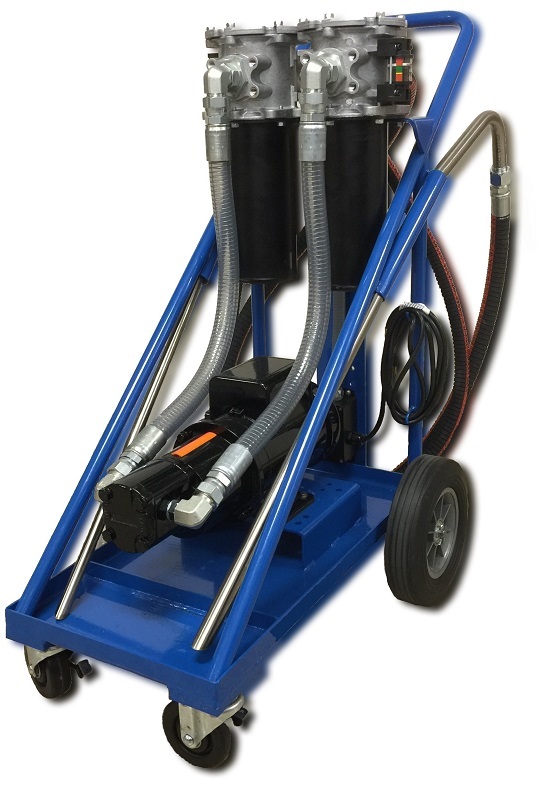 "Your One Stop for Hydraulic Filtration"
The Wilson Systems Filter carts are the ideal way to pre-filter and transfer fluids into reservoirs or to clean up existing systems. Fluid should always be filtered before being put into use. New fluid is not necessarily clean fluid. Most new fluids (right out of the drum) are unfit for use due to high initial contamination levels. Contamination, both particulate and water, may be added to a new fluid during processing, mixing, handling and storage. 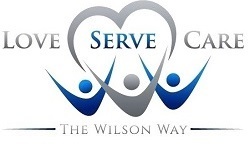 The Wilson Systems filter cart uses two high capacity filters for long element life and better system protection. The first stage (inlet) filter captures larger particles, while the second stage (outlet) filter controls finer particles or removes water. Special features designed into the Filter Cart include a heavy duty 2 wheel hand cart with a 400 pound rating. The cart also has 10” x 2” ball bearing wheels mounted on a heavy duty 5/8” axle. A rugged industrial gear pump moves the fluid from one location to another using seven foot, flexible, reinforced, hoses with stainless steel wands. Using a Wilson Systems portable filter cart is the easiest and most economical way to protect your system from harm that can be caused by contamination. 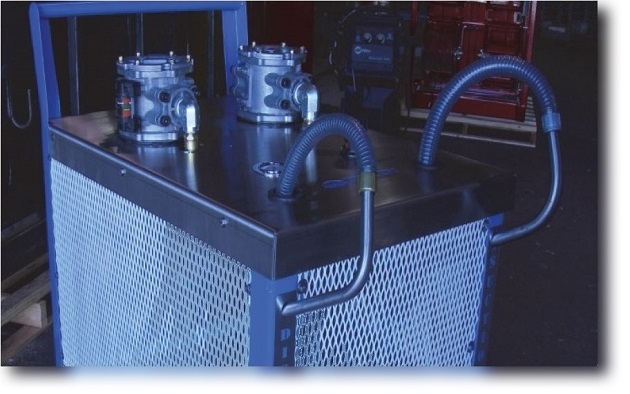 Wilson Fluid Power Solution can also supply custom fluid conditioning systems. 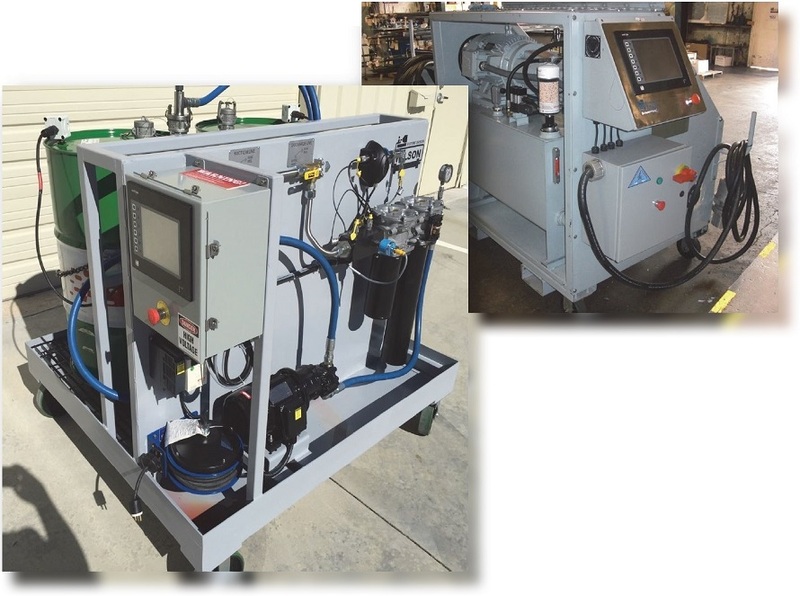 If you have a particular specification or requirement, we can support your need for a custom fluid conditioning and transfer system. We can deliver a quality product with concept development, design and specification development, proper part and material specification, highly technical manufacturing capabilities and a best in class quality system. All of which supports our drive for customer satisfaction.